This package includes MyLab Accounting. 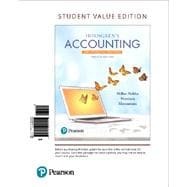 Horngren’s Accounting, The Financial Chapters present the core content of principles of accounting in a fresh format designed to help today’s learners succeed. As teachers first, the author team knows the importance of delivering a reader experience free of obstacles. Their pedagogy and content uses leading methods in teaching critical foundational topics and concentrates on improving reader results--all tested in class by the authors themselves. With this in mind, the 12th Edition continues to focus on readability and comprehension and takes this a step further in the managerial chapters by employing a new theme to help readers see how managerial accounting is used as a tool to help all business people make decisions. By providing more meaningful learning tools, this title helps readers clear hurdles, like never before. MyLab™ Accounting is an online homework, tutorial, and assessment program designed to work with this text to engage students and improve results. Within its structured environment, students practice what they learn, test their understanding, and pursue a personalized study plan that helps them better absorb course material and understand difficult concepts.